English is a complicated language. Yet most people who learn it as their second language seem to be far more fluent than the rest of us who study, say, Spanish or French for a few years in high school. Why is that? Maybe it has something to do with all those double entendres, colloquialisms and oxymorons we spout both for comedic purposes and, let’s be honest, because we misuse them… Often. Passenger-seat driver. That one’s pretty self explanatory… When I’m chauffeuring my Dad around town on various errands, he’s always pointing out every car that he thinks is in my way or every sign that he thinks he’s reading correctly or every imminently dangerous situation that’s about to occur (in his opinion) while sitting in the passenger seat instead of the back seat – where people usually sit when they want to annoy drivers. Upside-down knife. Imagine cutting into a nice piece of steak… and cutting and cutting and you’re about to send it back because it’s like a piece of rubber. Then you’re told it’s not the meat, it’s the knife. Meaning, the knife is upside down. You’ve been painstakingly trying to cut something with the serrated edges up instead of down. My Dad, sadly, suffers from this anomaly. But, on the bright side, think how many calories he burns in the effort. 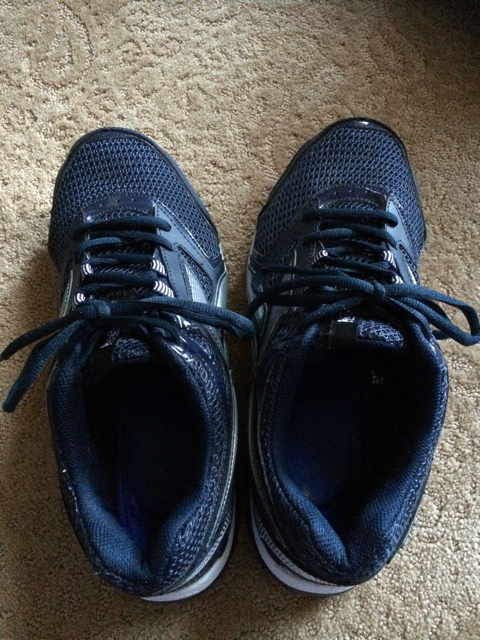 Two-left shoes. We’ve all heard the expression ‘two left feet’ when referring to someone (hopefully not you) who couldn’t dance. But what about someone who can’t see or feel the difference when putting his shoes on the wrong feet… It seems like they’d notice that right away, doesn’t it? Only, my Dad keeps walking up to me with his shoes on the wrong feet and asking me if they’re right. It would be beyond cruel to not correct him or, worse, to wait and see if he eventually noticed (I’m no prankster but I know there are people who find great joy in tying someone’s shoe laces together under the table in hopes that, once they get up, they’ll immediately trip). As many of you have undoubtedly tried, at one time or another, I have learned to forge my parents’ signatures. Now, before anyone gets all uppity and tells me this isn’t exactly legal, I have been asked by both my parents to perfect their signatures. Mom wants me to do it because our signatures are similar and, this way, I don’t need to drag her around with me to pick up her meds or to deposit her checks. In Dad’s case, he just can’t see well enough to get his signature to land in the correct spot. When I’ve taken him to the bank, I have to point to the area where his signature is required. However, between the time I get his pen to the paper and he actually begins writing, he always manages to move his hand. Banks frown on signatures that end up outside the ‘write-in-this-area-only’ section. And when it comes time to signing your name at the pharmacy counter, it’s very difficult for a sight-challenged person to write with those ridiculous pens that are attached to the machine – especially the ones with the invisible signatures. 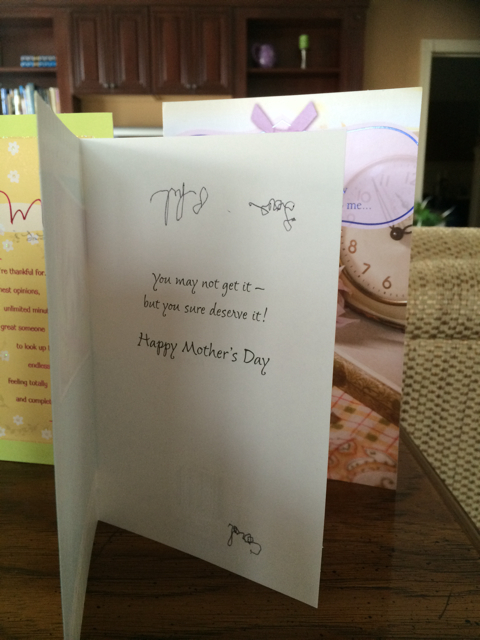 When Dad asked me a while back to take him to buy Mom a Mothers Day card, I had to first pick out the card, then buy it (nothing says love like a card from the dollar store) and, when it came time to signing it, Dad insisted he could do that much by himself. So I let him. The end result was a card signed upside down. But we didn’t tell him that. Because we love him. To save both time and stress, learn to compromise and remember – it’s the thought that counts!